It’s #MeatlessMonday again, and this week we’ve got a Mexican recipe for you #SWEATMEs – a yummy, south of the border break in between our holiday meals. When cooking vegetarian dishes, beans are a great way to get protein and complex carbohydrates. Use the hashtag #SWEATmeals to share your #MeatlessMonday pics. You might even be featured on our @sweatfitness Instagram and @sweat_fitness Twitter accounts! Preheat oven to 350°F. Pierce 1 sweet potato all over with a fork, and roast until tender, about 40 minutes. Mash the potato. Combine in a medium saucepan with diced tomatoes and curry powder; heat to a boil. Remove from heat. Purée mixture with an immersion blender or food processor until smooth. Set aside. Grate the second (uncooked) potato. Heat a large saucepan over medium-high heat. Add shredded sweet potato, garlic, and onion and cook 1-2 minutes or until it begins to stick to the pan. Add 1/2 cup water, salt, pepper, and cumin, cover and cook 3 to 5 minutes or until the sweet potato is tender. Remove from heat and stir in black beans and spinach until mixture is evenly combined. Spoon one-eighth of the bean mixture down the center of each tortilla. Wrap and roll tortilla to the end of a rectangular baking dish. Repeat with remaining ingredients. Top with tomato and sweet potato purée sauce, then sprinkle cheese on top. Bake about 20 minutes or until the cheese melts and the edges of the tortilla start to brown. Top with sliced avocado just before serving. 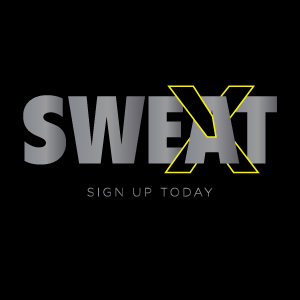 Don’t Just Sweat – SweatX! Get special deals on our app! © 2019 Sweat Fitness. All rights reserved.